If Aussies know how to do one thing well, it’s supporting our mates. 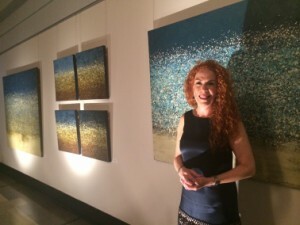 On Friday 9th May, art-appreciating Australians congregated at Riverside Drive on the Upper West Side to view the tremendously talented Jacinta Stewart’s works. We sipped hibiscus flower cocktails and mingled with like-minded people as we rejoiced in the familiar beauty of the Australian seascapes exhibited on the walls around us. We sentimentally gloated about our home country, exchanging memories of our youths spent immersed in nature and by the beach. While stunning Australian seascapes were the feature theme of the night, the exhibition included a nod to our surrogate home too. I particularly loved the portraits of mesmerizing lily ponds in Central Park, New York on a summers afternoon. The artist herself was the star of the evening, appropriately celebrated with the support of a didgeridoo player to round out an authentic Australian experience. Jacinta specializes in acrylic paint medium and uses museum grade materials. She continues to study art and is constantly exploring the new subject matter around her. Her artwork was publicly recognized when she won “Best of Show” at the Art Students League of New York in 2011. As an Aussie trying to ‘make it’ in America myself, learning more about the story of this wonderful artist certainly inspired me. Jacinta goes above and beyond by donating 15% of all profits to The Dwelling Place, a shelter for homeless women in Hell’s Kitchen, NY. Giving back to the community that has so warmly embraced her. Keep up the fabulous work, Jacinta. You’re certainly doing us all very proud.